Fatigued by late winter, I’ll think of Ireland. There, traditional spring arrives on St. Bridget’s Day, the first of February, when daffodils line country lanes, primroses pop up in rock walls and white bells of wild garlic swing alongside village paths where the meadows are always green. Though Ireland is more than ten degrees (latitude) north of Chicago, the Gulf Stream warms the land. South of Dublin there’s scarcely ever snow or ice; winter vegetables such as leeks, broccoli and kale stand ready in kitchen gardens even in the coolest season. Farther north of the equator means less sun in the day, but as March approaches a good stretch of light sails into early evening, and birds break into dawn chorus with morning coffee. 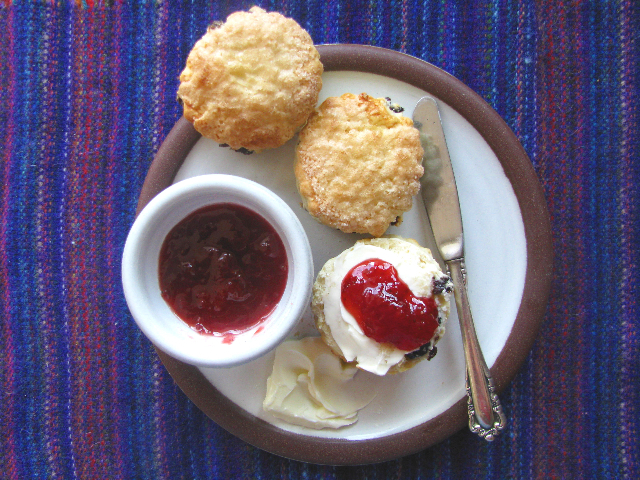 Once you arrive on the island, you’ll be assured of a good pot of tea and a plate of perfect scones. Americans aren’t content with the best scones, the simple, light “floury” ones with just a hint of sugar and maybe a few currants or raisins. No, we have to gussy them up with too much butter, dried cranberries, chocolate chips, extra flavorings and grains until they’re often leaden lumps of baked dough distant from their ancestral roots. When winter’s still on the sill and afternoon tea beckons, consider a tray of scones. These quick breads take about five minutes to stir together, twelve minutes to bake, fill the room with great home-cooked aromas, and charm the blarney out of all ages. With soft butter and a blob of bright homemade jam, Irish scones are the ticket for a daydream. Try this small recipe to learn the technique, then double the amounts for a larger batch and store some in the freezer. Preheat oven to 450°F. Have ready a baking sheet lightly sprinkled with flour, lined with parchment or silpat mat. Beat egg in liquid measuring cup; remove 1 tablespoon and save in small cup for egg wash. Add milk to the remaining egg (the total should measure 2/3 cup); whisk together. Sift together flour, 1 tablespoon sugar, salt and baking powder. Cut butter into slices and rub into flour with your fingertips. Make a well in center of dry ingredients. Add milk mixture and begin to mix with your hand or rubber spatula, sprinkling in raisins or currants. Once dry mixture is thoroughly moistened, scrape scone dough out onto lightly floured surface. Knead lightly to bring the dough together, scrape dough from your hands and pat or roll to circle 3/4 inch thick. Cut into 7-8 2 1/2 inch scones, re-rolling scraps. Place scones on baking sheet, brush tops with reserved egg wash, and dip each top in sugar. Bake in preheated oven 12-14 minutes or until lightly brown. (Finished scones should be 1 ½ inches high.) Serve warm or at room temperature with butter or whipped cream and jam. Note: If your baking powder is not fresh, make your own by combining baking soda and cream of tartar. Mix 1/2 teaspoon cream of tartar with 1/4 teaspoon baking soda to equal leavening of 1 teaspoon baking powder. For this recipe use 1 teaspoon cream of tartar + 1/2 teaspoon soda. The birria woman commands her white wooden street-food cube on the corner of Madero and Constitución. There’s always a group of eaters on her benches when the window flaps are down and the hand-pressed tortillas are flicked from a hot griddle. Elbow to elbow three women chop onions, fill tacos and assemble garnishes for the famous Jalisco birria, spoon-tender beef cooked in chili-scented broth, simmering in a giant cauldron. When in tapatío country, it’s a specialty not to be missed. Street food vendors often provide the best authentic local cooking in Mexico. Use common sense, and it will be easy to spot safe street stands. With wide-open cooking and serving areas, cleanliness is on display. It’s also wise to observe who’s gobbling up the offerings handwritten on a menu board above the work area. The birria stand’s white-aproned workers with their hair tightly netted keep the counters scrubbed and the day’s ingredients neatly stowed, although the pace of plating never seems to let up. Whether you order a bowl of the specialty stewed beef complete with fresh tortillas, chopped onions and limes, or a taco plate, homemade salsas in plastic squeeze bottles wait for the taking. There’s always a dark red picante sauce made from ground chiles arbol, and a tart green sauce made from tomatillos (Mexican green tomatoes in papery husks) and green chili. Both salsas are easy and inexpensive to prepare and will give you the chance to really cook Mexican in just a few minutes. My favorite version of the green salsa, always a winter favorite, came from one of Jodie’s culinary adventures. Here’s a three-ingredient wonder sauce prepared in the traditional way on the stovetop. With a pound of tomatillos and a couple of Serrano chilis you’ll wonder why you ever paid so much for a jar of store-bought salsa. All you need is a frying pan, a lid and a blender. Film a heavy frying pan with oil. Add the tomatillos, whole chilis and garlic cloves. Cover and cook over medium/low heat for 20-25 minutes, turning the tomatillos and chilis halfway through, or until everthing is soft. The tomatillos and the chilis may brown lightly. Turn off heat, leave covered and allow to cool until cooked items are cool enough to handle. Scrape the tomatillos, garlic and one whole chili into a blender along with all the cooked juices. Add ½ teaspoon salt and blend to a puree. 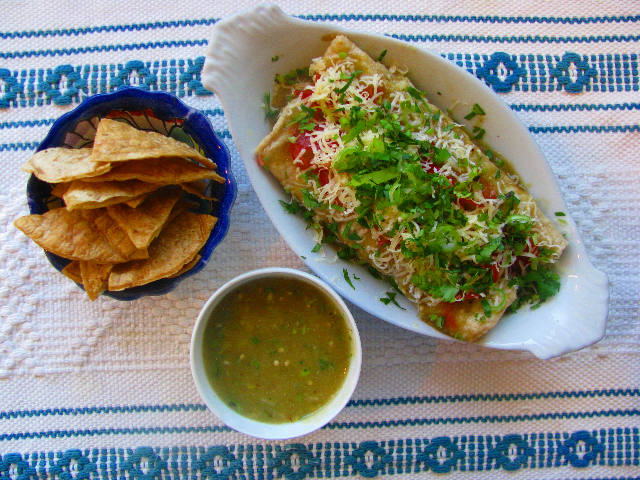 Use the salsa as it is with chips, for tacos, salads, sandwiches or thin with some stock for an enchilada sauce. Jazz up the salsa with some finely chopped white onion or scallions, cilantro and diced avocado. Makes 2 cups; keeps 5 days in the fridge. You are currently browsing the Mary Jo's Kitchen blog archives for February, 2012.